I’ve never been so excited about a cocktail! 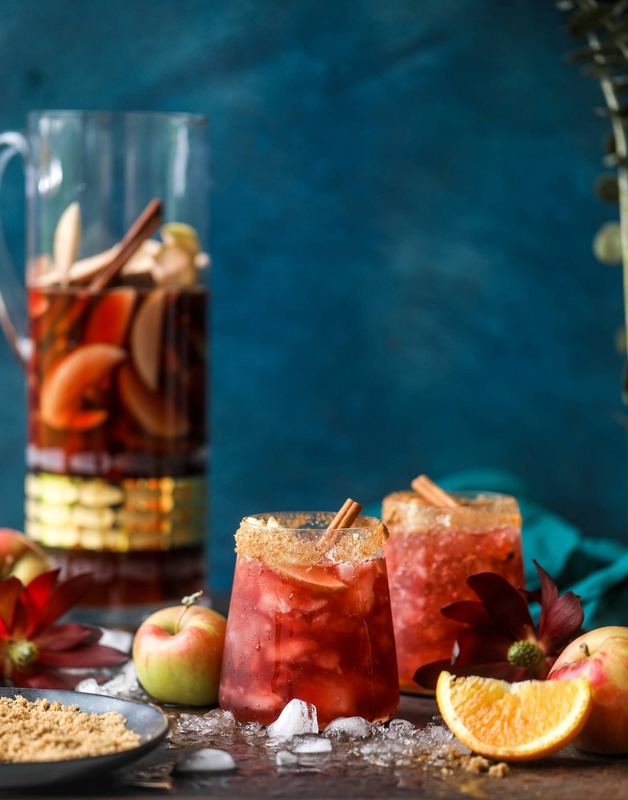 This red apple sangria is giving me all the heart eyes. 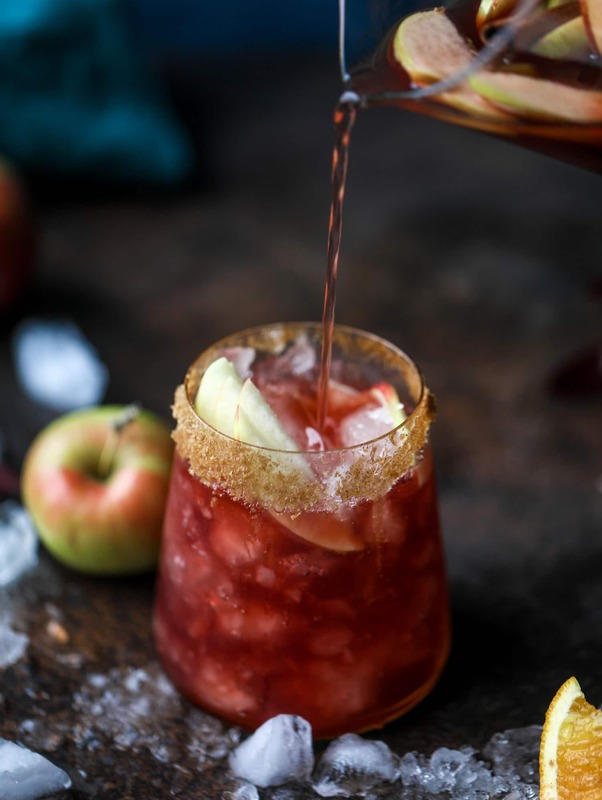 Aside from this drink basically LOOKING like October, this red apple cider sangria is one of my most anticipated drinks for fall. 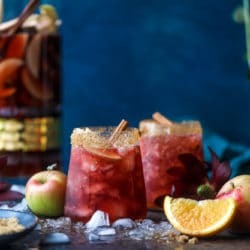 It’s been on radar and I was determined to make it my signature fall cocktail this year. I’m not disappointed! So. 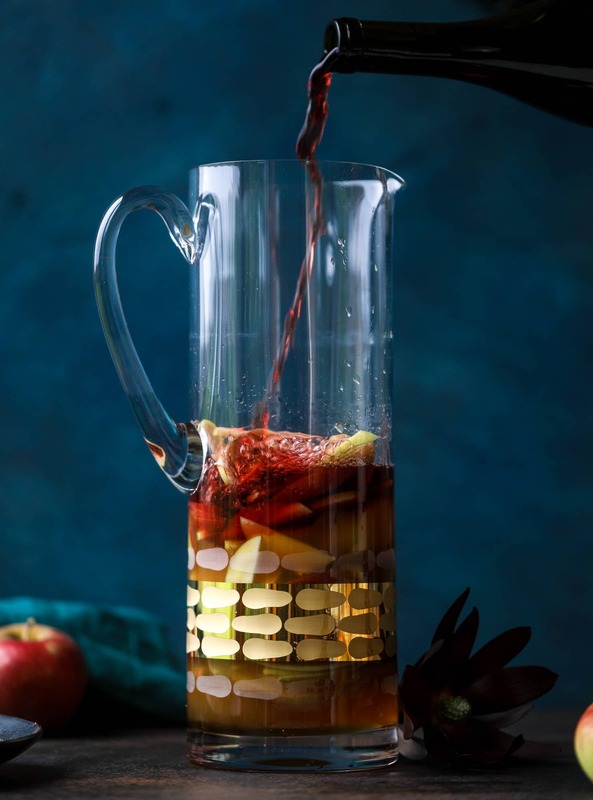 Regular old apple cider sangria is one of the most popular recipes here on the blog. I made it AGES ago and you guys love it so much. It’s constantly one of my top recipes, usually all the way through winter and into spring! It’s just SO good. Especially if you’re an apple cider freak like me. I adore apple cider. It’s so much better than pumpkin and salted caramel and all the other fall flavors. You know? Apple cider reminds me of all things warm and cozy, chilly cool air and crunchy leaves, plaid scarves and bonfires. A grown up version of that with booze might just be the best thing ever. Here’s the deal. 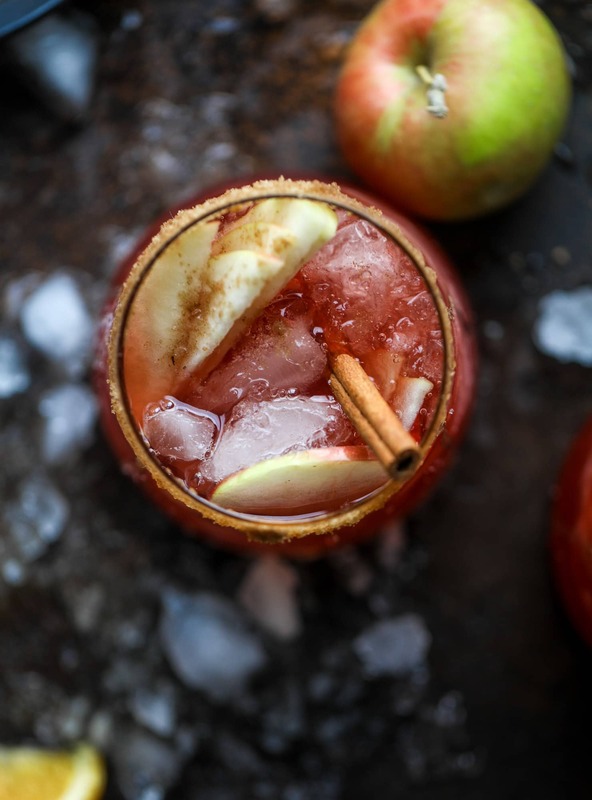 For me, this is like… grown up apple cider sangria. 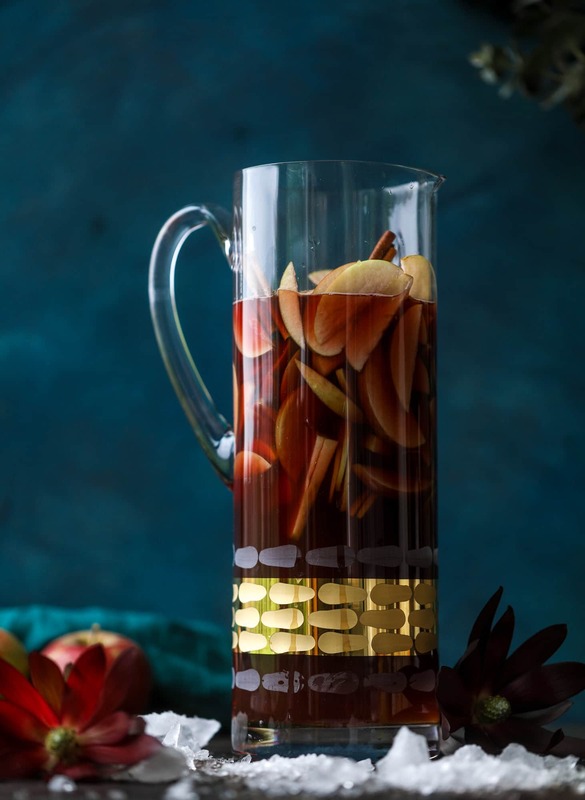 Adult apple cider sangria, if you will. It’s not as sweet as the traditional version. It’s red wine based which is automatically more adult-like in my brain. I sweetened it with a touch of maple syrup and you can use as much as you’d like to get it as sweet as you’d like. Instead of brandy I used a bit of grand marnier for a little hint of orange, which really brings in all those flavors of fall. Cinnamon sticks too. Added a cinnamon sugar rim too because I’m the most predictable! I won’t say that I love it more than my popular regular old apple cider sangria. After all, I’m more of a white wine/rosé lover than a red wine lover. BUT it really is just as good. If you prefer red wine and you’re very much over sweet drinks, you’ll freak over this. It’s destined to be in the rotation until at least December. For sure. 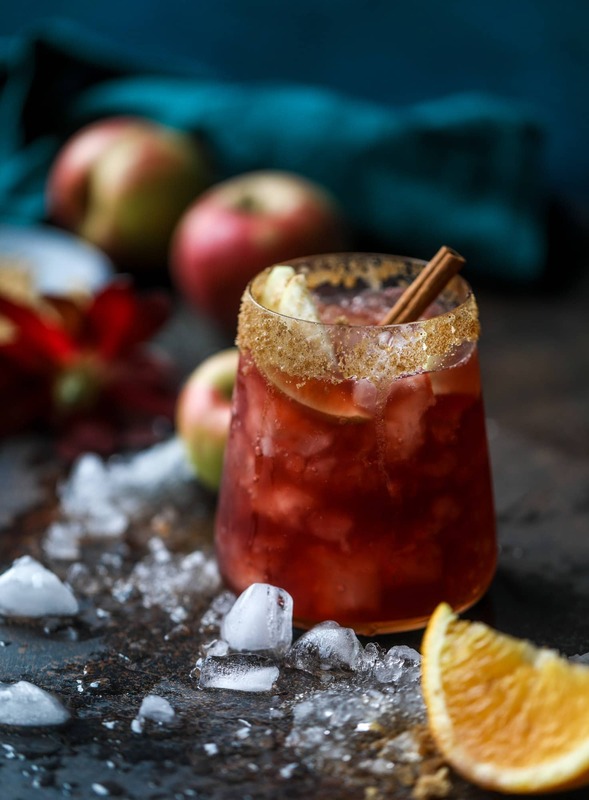 Red Apple Cider Sangria is the ultimate sangria for fall! It is sweetened with a touch of maple syrup and instead of brandy I used a bit of grand marnier for a little hint of orange. To serve, mix together the brown sugar and cinnamon on a plate. Rim the glasses with an orange wedge and dip in the cinnamon sugar. Fill the glasses with ice and pour the sangria over top, being sugar to get some of the fruit in there. ENJOY. YES!! i am doing a site overhaul this fall/winter and that is coming! :) thank you so much courtney! First, this color is just GORGEOUS! And second, I need this in my life right now. It looks so crisp and refreshing! The colors of this cocktail! So, so gorgeous. Seriously, you are so talented at shooting cocktails / things in glasses. So excited about this! I’m a long-time reader and always look forward to your apple cider-based recipes. Can’t agree more that apple cider > pumpkin. Oh my!! Thats one beautiful looking glass of sangria!! YUM!!! Ohhh! Fir sure making this! 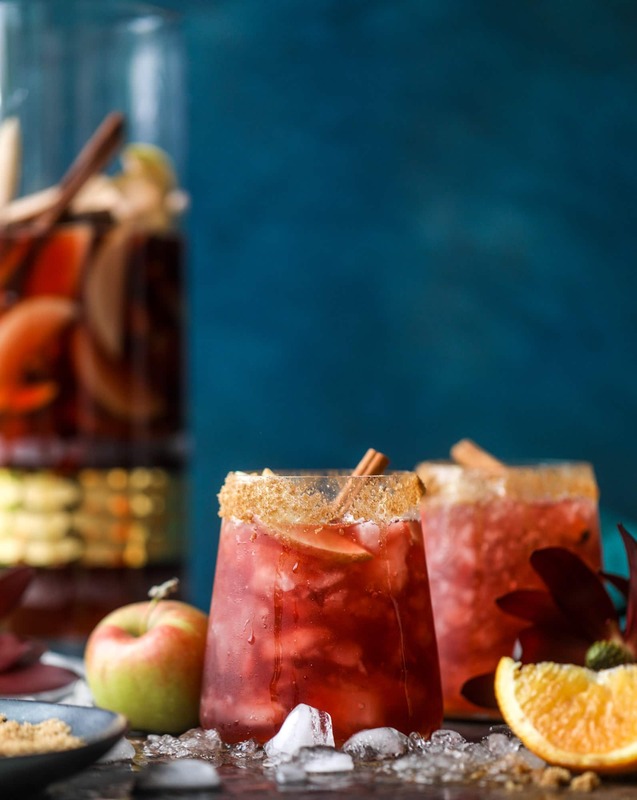 I’ve made your apple cider sangria more times than I can count and it’s always a hit! Love this! But Any ideas on a non alcoholic version?? hi janna!! i’m not sure what you could try to replicate the red wine (maybe cranberry juice??) – or you could even use some sparkling apple cider (non alcoholic). 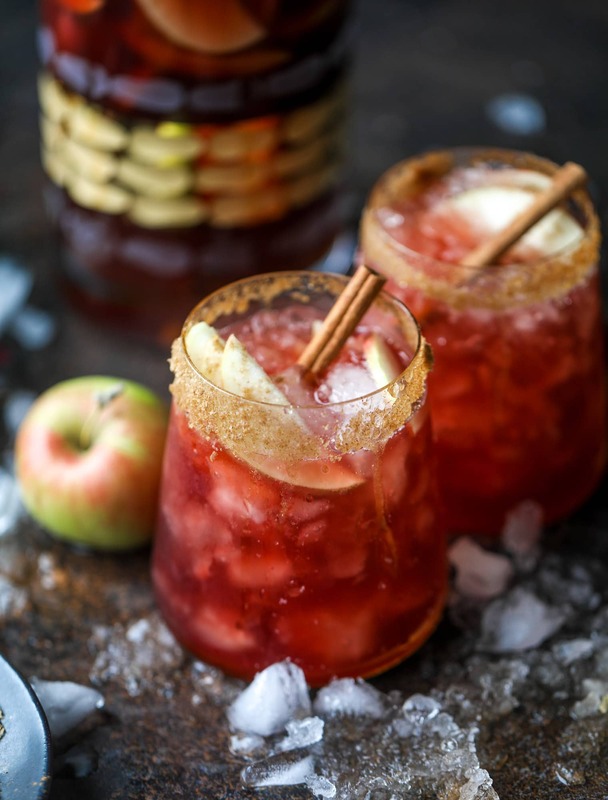 but i do have 2 amazing fall mocktails that are alcohol free! “Being sugar” is the best type I’ve ever read in my life please do not fix it. Love this one! And the presentation is so beautiful on the photos (actually that was the reason why I decided to try it :-)). Cinnamon sugar rim and really nice touch both visually and taste wise. Your fall and winter citrus recipes are my favorite! While I eat pumpkin things, I totally agree that apple recipes are so much more exciting! As a kid the only pumpkin things was pumpkin pie, which I didn’t eat, but I loved going apple picking and drinking fresh cider. This is in my fridge chilling right now and I can’t wait to pour my first glass! Cheers! I’m not even a fan of red wine but this was incredible! 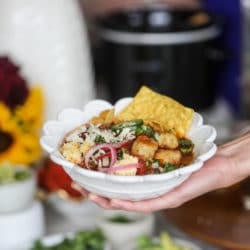 I made it for a date night at home with my husband and it was too delicious! OMG, Just made this, so fabulous! Made 2 batches on Monday and took one batch to a girls night Monday evening- it was a big hit! Just cracked into the second batch tonight and it’s even better after sitting for 2 days. Side note: cinnamon sticks are pretty pricey (#amazonprime those bad boys) but having one in each glass definitely takes it to the next level! Can I make this a day ahead of time?